Here is my topic about DiRT RX. First of all this could be a seperate game, but also be a part of a game like it was in DR and D4. Please keep this topic about DiRT RX. All what i wrote are basically my ideas, opinions and visions I have about Codemasters or how the game it should be. Basically i give a summary most of it. About the car and track list I also explain some things in the document. So first here a possible game cover. 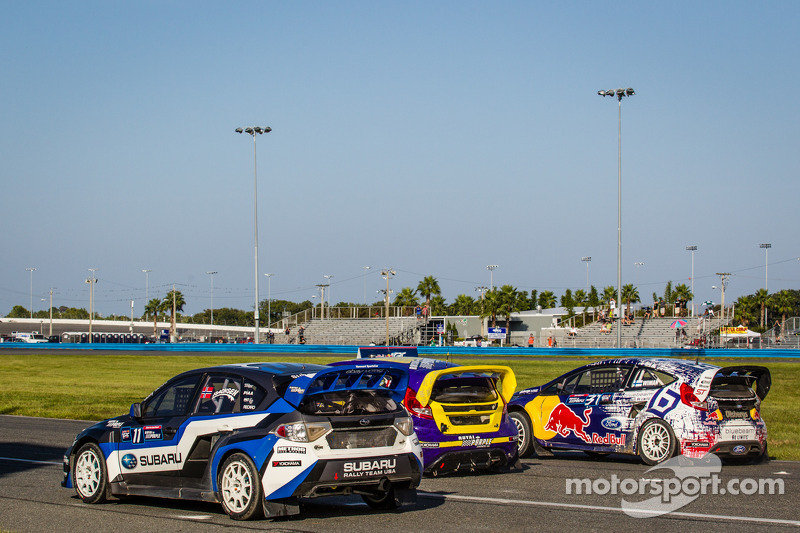 The image has the 2017 cars and is being used for the USA WRX round. Somehow I think it had the good feeling for the box art. Next to that I not was in the mood to be busy with Photoshop for to long time. The career mod in DiRT 4 was strange and unrealistic. I think you should be able to do a seperate RallyCross career and not must some rally events first. I real ladder need to be there. So starting in a local series. If you perform enough well you can get a International license B etc. Basically i follow two base principles for this career ladder: Firstly the F1 Superlicense (you need to score enough points in junior classes, so perform well in a certain amount of season to get a superlicense) and secondly the career progression in TOCA/DTM Race driver. A season is really a season. So when you have International License A, you have the capacity to do a minumum of 10 events a season, but maybe not compete in multiple championships in the same weekend. So you could choose to do the full ERX season, plus additional ARX and local Supercars events. The local championship could be a British Supercars championship with events at Lydden Hill and Silverstone. Earning money went to quickly in DiRT 4. If you do an event, you basically can buy an car already. You won money in an event in DiRT 4, but IRL drivers and teams are dependend on sponsorship. Also need to buy spares, or service the engine and gearbox, etc which costs money. And if you have a big crash, maybe you won't be able to repair the car in time for the next event. Basically these aspects can be much more realistic and depth in the game. You should be able to do a career in RX and Rally seperately. I can talk a lot more how a career should be working and what can improved. But maybe I will do that later. Basically for Supercars I would like to have the 2018 WRX cars, all the Supercars from DiRT Rally and DiRT 4 to return because they already are made, 2018 ARX content and 2018 ERX content. Next to that it would be nice to have some modern legends. The list down below here is something I think would be ideal. Maybe the best way for Codemasters to make this possible happens is by having the 2018 World RX Supercars be available at release, and three DLC packages, namely ARX, ERX and Modern Legends. 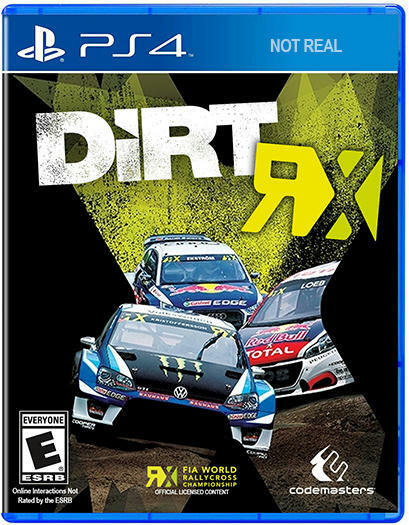 On another note, I don't think they would ever release the game with less rallycross tracks than DiRT 4. I'd say they could add Austin, Barcelona and Silverstone quite easily as the tracks have already been made for previous Codemasters titles and they'd only need to make the rallycross tracks without having to create all of the scenery. Yes, Silverstone is a bit different compared to CotA and Barcelona, as they not use the F1 track, but the Stowe track behind the pit building. Though the surrounding and building (pit complex) and stuff can all be used, which sometimes event take the most time. Cutting down stuff is one way to do it, but you need to keep in mind the cameras that will be used. If the game will have a helicopter overview of the track, than you not cut down just everything. An example is the new pit wing at Silverstone. Though it is not being used by the RX teams, the building is certainly visable. So what the developers do it (A) cut down stuff and (B) use a lower LOD for the pit building. - They can close the garage doors and remove the pit interiors. - The pit building can have a lower LOD. As you not will be close to the pit building, the poly can be lowered quite a lot, meaning that the poly count of a pit building could even be lower than the rear view mirror of an RX car, especially as the building has big flat parts. An example is down below here of an tire. It is quite visable the tyre has less polygon at LOD 1 and LOD 2. But if you zoom out and possible add a little blur, than both wheels look the same. So with Silverstone they will kinda do the opposite as with the F1 game. Where the F1 track and pitbox are very high poly and the stowe track is very low poly, in the new DiRT (expected new rally game) the Stowe track is high poly and the F1 track is low poly. You don't mention the lobby's. Career idea is good as long as I am able to race with friends without bothering about money, buy cars etc. 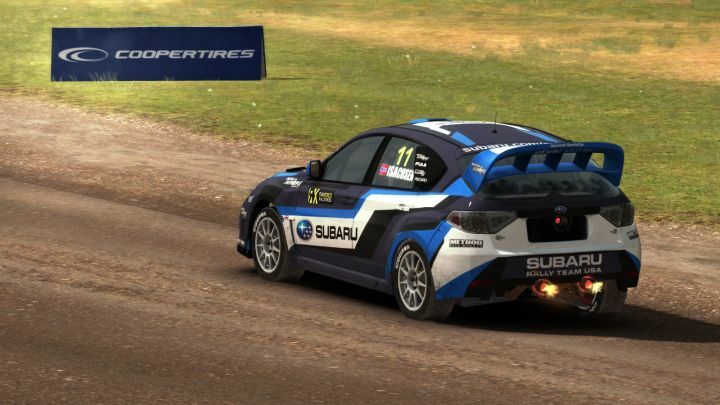 But DiRT Rally all the official Supercar cars/liveries who were in the game, were from the 2015 season, except the Subaru which was from the 2014 season. It can be good news though, as mixed seasons/cars could appear in the game and, meaning more car models. 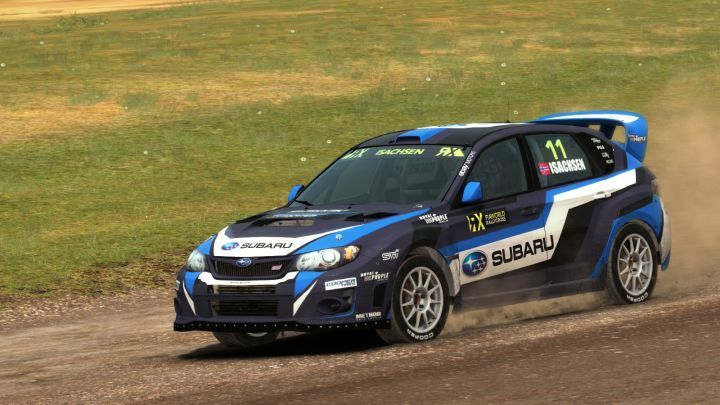 Next to that, the Subaru was in GRC Supercars spec in the game, while the actual Subaru competing was different 'updated' spec. This maybe has to do with licensing and getting 3d models, but still interesting these many differences as it is the only Impreza, compared to the different specs Fiestas there were (and only the OMSE was used). I wonder why I never noticed this on the Subaru before. - Some other details, and the actual car seems a bit wider as well. The car that Isachsen ran in Canada (in 2014) was a fresh build at the time. If I recall correctly that chassis was prepared in Europe and built to conform with the World Championship regulations, the most obvious difference is the location of the rear intakes for the radiator. Most of the rallycross cars in DiRT Rally and DiRT 4 have minor errors on them if you look closely. There are also subtle differences between most of the different versions of the same chassis (most notably with the Fiesta and Peugeot 208). These are only trivial things though and I appreciate that modelling the same car several times (for those of us who look too hard at the little details) is a drain on resources that could be used elsewhere when developing a game! Awesome! It will be perfect to get a full RX game!